The channel between a single-antenna user and an -antenna base station can be represented by an -dimensional channel vector. The canonical channel model in the Massive MIMO literature is independent and identically distributed (i.i.d.) Rayleigh fading, in which the vector is a circularly symmetric complex Gaussian random variable with a scaled identity matrix as correlation/covariance matrix: , where is the variance. With i.i.d. Rayleigh fading, the channel gain has an Erlang -distribution (this is a scaled distribution) and the channel direction is uniformly distributed over the unit sphere in . The channel gain and the channel direction are also independent random variables, which is why this is a spatially uncorrelated channel model. One of the key benefits of i.i.d. Rayleigh fading is that one can compute closed-form rate expressions, at least when using maximum ratio or zero-forcing processing; see Fundamentals of Massive MIMO for details. These expressions have an intuitive interpretation, but should be treated with care because practical channels are not spatially uncorrelated. Firstly, due to the propagation environment, the channel vector is more probable to point in some directions than in others. Secondly, the antennas have spatially dependent antenna patterns. Both factors contribute to the fact that spatial channel correlation always appears in practice. One of the basic properties of spatial channel correlation is that the base station array receives different average signal power from different spatial directions. This is illustrated in Figure 1 below for a uniform linear array with 100 antennas, where the angle of arrival is measured from the boresight of the array. Figure 1: The average signal power received at a Massive MIMO base station from different angular directions, as seen from the array. Spatially correlated fading implies that this average power is angle-dependent, while i.i.d. fading gives the same power in all directions. As seen from Figure 1, with i.i.d. Rayleigh fading the average received power is equally large from all directions, while with spatially correlated fading it varies depending on in which direction the base station applies its receive beamforming. Note that this is a numerical example that was generated by letting the signal come from four scattering clusters located in different angular directions. Channel measurements from Lund University (see Figure 4 in this paper) show how the spatial correlation behaves in practical scenarios. 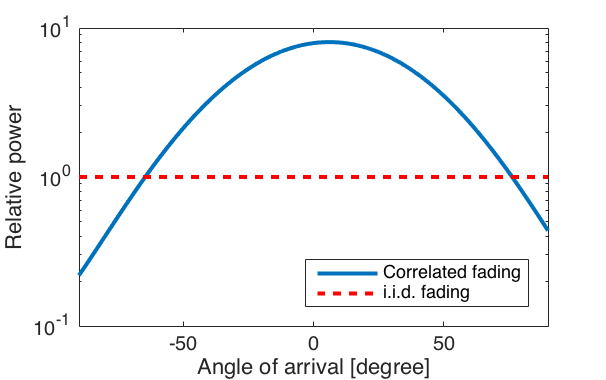 Correlated Rayleigh fading is a tractable way to model a spatially correlation channel vector: , where the covariance matrix is also the correlation matrix. It is only when is a scaled identity matrix that we have spatially uncorrelated fading. The eigenvalue distribution determines how strongly spatially correlated the channel is. If all eigenvalues are identical, then is a scaled identity matrix and there is no spatial correlation. If there are a few strong eigenvalues that contain most of the power, then there is very strong spatial correlation and the channel vector is very likely to be (approximately) spanned by the corresponding eigenvectors. This is illustrated in Figure 2 below, for the same scenario as in the previous figure. 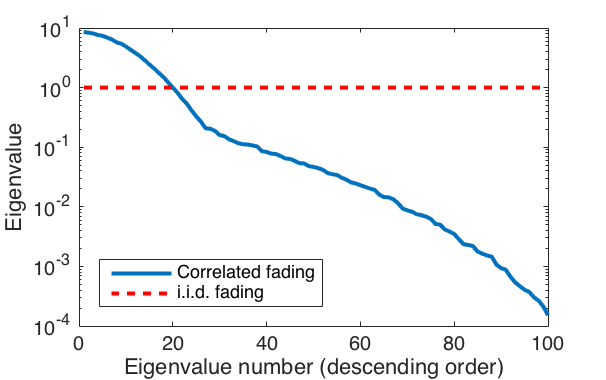 In the considered correlated fading case, there are 20 eigenvalues that are larger than in the i.i.d. fading case. These eigenvalues contain 94% of the power, while the next 20 eigenvalues contain 5% and the smallest 60 eigenvalues only contain 1%. Hence, most of the power is concentrated to a subspace of dimension . The fraction of strong eigenvalues is related to the fraction of the angular interval from which strong signals are received. This relation can be made explicit in special cases. Figure 2: Spatial channel correlation results in eigenvalue variations, while all eigenvalues are the same under i.i.d fading. The larger the variations, the stronger the correlation is. One example of spatially correlated fading is when the correlation matrix has equal diagonal elements and non-zero off-diagonal elements, which describe the correlation between the channel coefficients of different antennas. This is a reasonable model when deploying a compact base station array in tower. Another example is a diagonal correlation matrix with different diagonal elements. This is a reasonable model when deploying distributed antennas, as in the case of cell-free Massive MIMO. Finally, a more general channel model is correlated Rician fading: , where the mean value represents the deterministic line-of-sight channel and the covariance matrix determines the properties of the fading. The correlation matrix can still be used to determine the spatial correlation of the received signal power. However, from a system performance perspective, the fraction between the power of the line-of-sight path and the scattered paths can have a large impact on the performance as well. A nearly deterministic channel with a large -factor provide more reliable communication, in particular since under correlated fading it is only the large eigenvalues of that contributes to the channel hardening (which otherwise provides reliability in Massive MIMO). Previous PostReflections on “Massive MIMO: How Many Antennas Do We Need?”Next PostWhat is the Purpose of Asymptotic Analysis? How to make reconfigurable MIMO antenna arrays at 5G frequencies using phase shifters for wireless devices? Massive MIMO should be built with fully digital transceivers. Analog beamforming with phase shifters will only work satisfactory in special cases: single user communication with phase-calibrated arrays, line of sight propagation and a relatively small bandwidth. How does spatial correlation impact the channel capacity (data rate). Is there any tradeoff between spatial channel correlation and spectral efficiency? I would like write a paper on spatial channel correlation. It depends on how the users are distributed. Users with similar spatial channel correlation will cause more interference to each other, while users with very different spatial channel correlation cause less interference to each other. On the average, it appears that spatial channel correlation improves the spectral efficiency. Emil Björnson, Jakob Hoydis and Luca Sanguinetti (2017), “Massive MIMO Networks: Spectral, Energy, and Hardware Efficiency”, Foundations and Trends® in Signal Processing: Vol. 11, No. 3-4, pp 154–655. DOI: 10.1561/2000000093. Question: Can we use “AMP Algorithm” in “Correlated Rayleigh Fading Model” for Activity Detection of active user? Actually I am working on massive connectivity but I have seen many researchers follow i.i.d fading channel instead of Correlated fading channel. It is often more analytically tractable to deal with i.i.d. fading channels, which is why many research advances are first made for i.i.d. channels and then generalized to correlated fading. Can you please suggest the chapter of your book and any other paper, where explains this a little bit…? Sections 3 and 4 explain these things in more detail. How to generate interchannel correlation matrix in Matlab? I’m considering the scenario of multi-user MIMO, where users are close to each other. It is commonly assumed that the channel realizations of different users are statistically independent in the multi-user MIMO literature, even when the users are close to each other. With this assumption, the inter channel correlation matrix is zero.